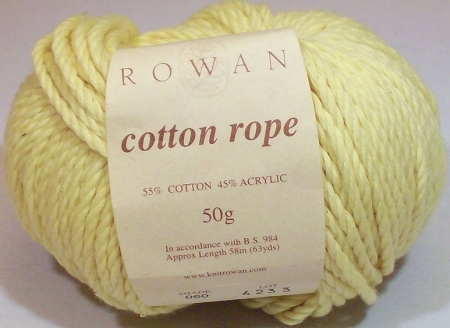 1.75-oz (50-gram) balls of Rowan Cotton Rope yarn. Each ball contains approximately 63 yards. This is a finely crafted yarn with gently twisted strands that look like delicate, soft rope. It's bulky enough to knit up quickly, but lightweight enough to use for spring/summer garments. Cotton Rope has been discontinued, so get it while you can. 55% Cotton, 45% Acrylic. Heavy worsted weight. 15 stitches = 4" on US size 10 knitting needles.